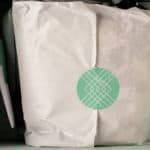 You are here: Home / Reviews / April 2018 Stitch Fix Review – I Kept it All AGAIN! 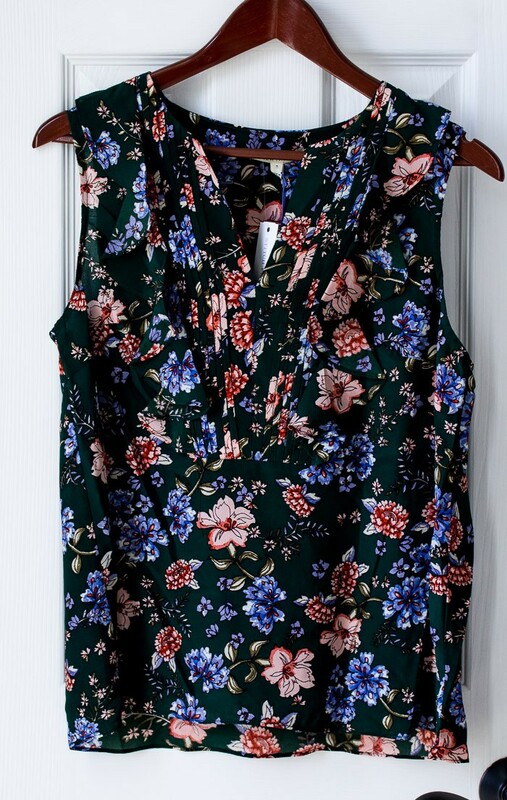 April 2018 Stitch Fix Review – I Kept it All AGAIN! 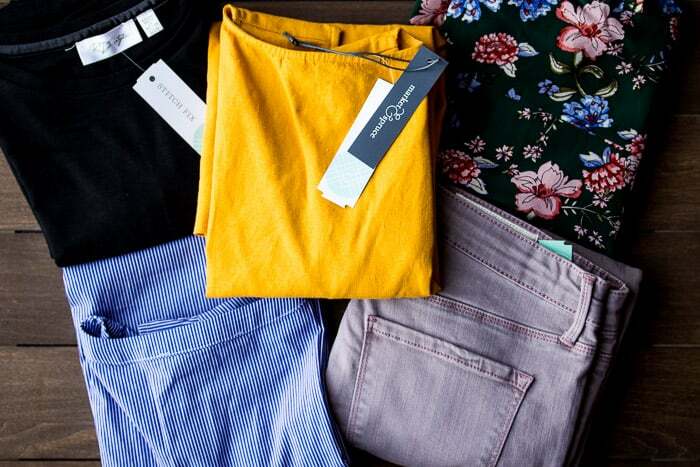 I kept everything in this April 2018 Stitch Fix review! This is only the second time that I have kept everything from my Stitch Fix box. I tried to be a lot more specific in my note to the stylist with what I was looking for and it paid off. Did I love every item? No. But 4 outta 5 ain’t bad! Now that that’s out of the way, let’s get to the clothes! For this fix, I asked for Spring items. I requested certain colors (I’m obsessed with mustard yellow lately) and even made notes as to what I didn’t want (hot pink!). My stylist was Roseann again. I was a little nervous after the last box, but it seems we’re back on track now! This was the first shirt I tried on. It’s actually dark green, but looks more black in the photo. I wasn’t sure I’d like the color on me and the length seemed a little short. But, when I tried it on, I loved it! I like the neckline and the ruffles (they are hard to see in the photo, sorry!) and even though I’m pale as can be right now, the green didn’t look too bad! I think it will look much better once I have a little self-tanner on again, though. This was an expensive shirt and if I wasn’t keeping everything I would have returned this based on cost alone. I don’t have a problem paying more for higher quality clothing, but since this is a shirt I won’t wear all the time, I don’t think it would have been worth it (for me) to buy on it’s own. Roseann saw that I had this pinned on my fashion board on Pinterest and was able to find one to send to me! She sized up on this item, knowing that sometimes tops are a little snug in the chest for me. I think I would have been fine in my usual size, but this shirt wasn’t so big that it looked bulky on me. I don’t care for it untucked as much as I do with the front tucked in. 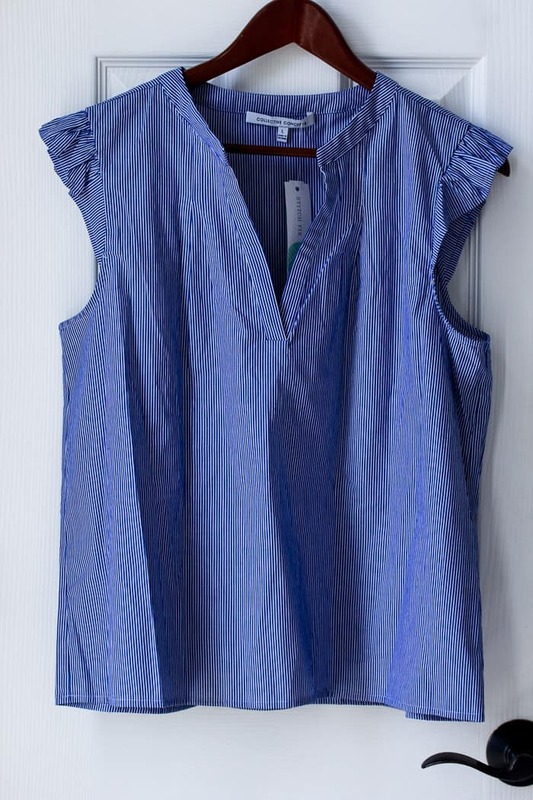 This is also a great shirt for layering, which I do often! I did look to see if an exchange was available, but there wasn’t. I do love that exchanging sizes is now an option though! As soon as I saw this, I knew I was going to keep it. 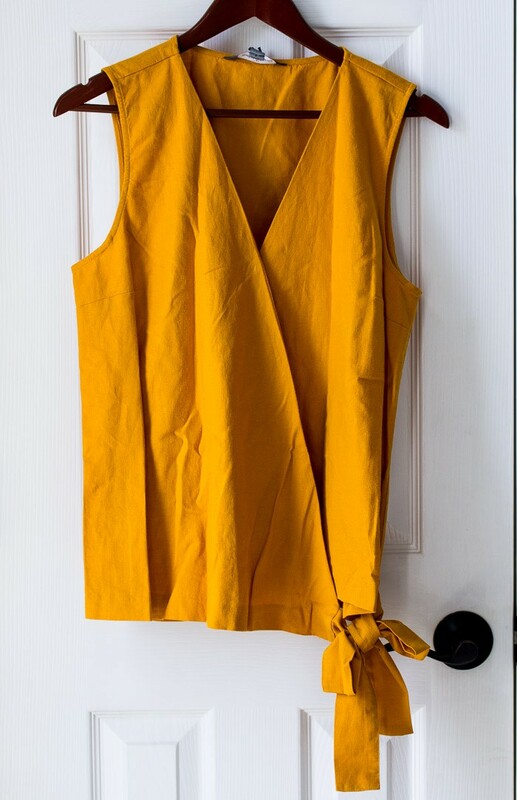 I don’t know what my obsession with this shade of yellow is lately, but I want it all! It’s not a flattering color on me at the moment, but after a little self tanner, it will be perfect! I love the v-neck and the bow at the bottom! The tie is actually adjustable so you can wear the bottom loose, or tighten it. The fabric is a little itchy, but it’s pretty minor, and won’t stop me from wearing this top as much as possible! Roseann sized up with this dress as well. I’m really glad she did because even a size up, this is still just a little tight in the chest area. I’m going hard with my diet and exercise still, so I’m hopeful this will fit perfect in a few weeks! She mentioned pairing this with cute sneakers and that’s exactly how I picture wearing this, along with a cute jacket! 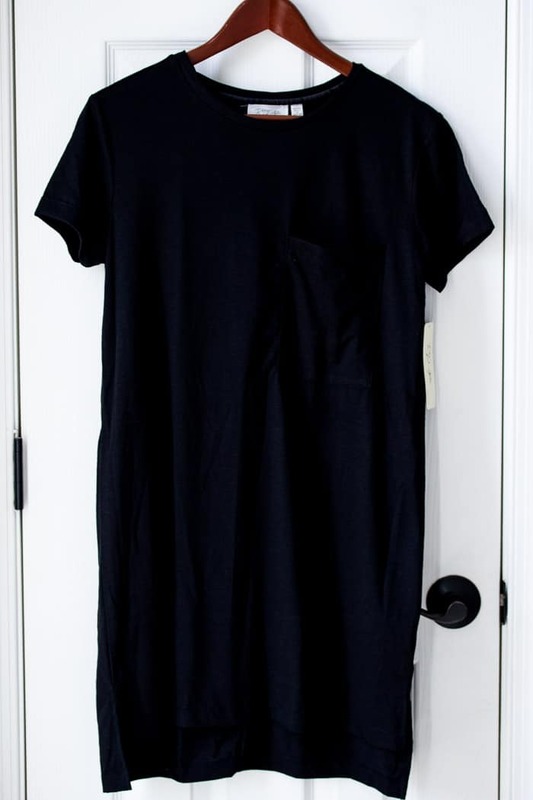 This dress has a little pocket on the front and is slightly longer in the back. This isn’t the highest quality item, but it’s definitely a great casual piece for running around with my kids this season. So, these jeans were actually a miss for me. I only kept them because with the 25% discount, there were basically free. They are my usual size for jeans, but way too tight. I also don’t love the zippers up the side of the leg. The smaller pocket zippers don’t bother me as much and I do like the unique color. I’m still undecided as to if I will hold onto them to see if they fit in a few months, or if I’ll list them on eBay, or if I’ll donate them. For now, they are hanging out in my closet until I decide. I’m really happy with this fix! I think that Roseann, once again, took everything I said into consideration when making her choices for me. 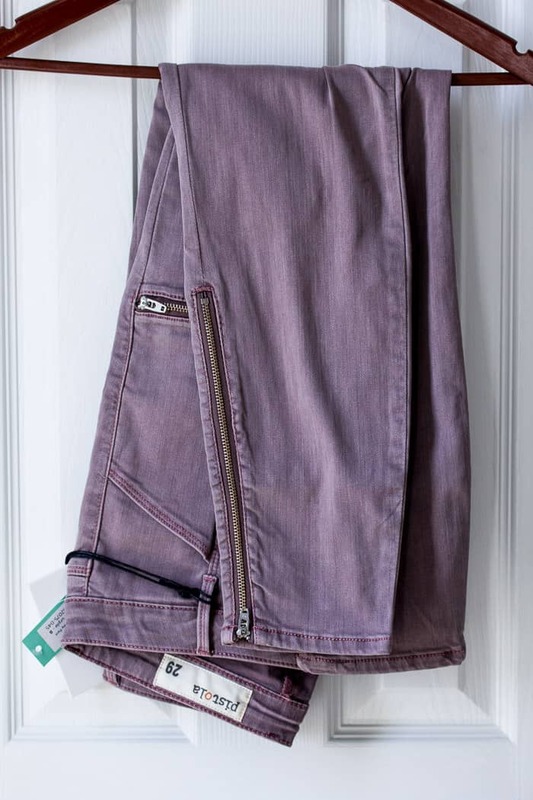 I’m kind of a plain Jane when it comes to pants and sizing can be so tricky! Just seeing how a shirt in one size can be too big and the next item in a size bigger is too small makes me totally understand how difficult it can be for the stylists! I definitely have to give her credit for trying to figure out when to size up for me. The total for my fix was $328.00. 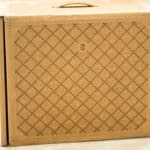 The 25% discount of $82.00 brought the total paid to $246.00 or just under $50.00 per item. For reference, I choose the $50-100 range for most items in my style survey. They have lower and higher-priced options, as well as maternity and men’s boxes now too! 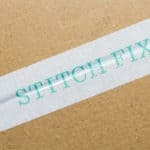 If you want to schedule your first fix, just head on over to the Stitch Fix website to get started! 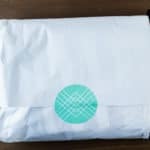 If you have any questions regarding the items in this April 2018 Stitch Fix review, fee free to send me a message or leave a comment! Interesting… I’m thinking of joining because I hate clothes shopping for myself. I take 10 things in the dressing room and might buy one or two on a good day. I’d love someone else do figure it out for me. I love it! It’s more expensive than shopping for yourself, but I would never pick a lot of the items they send and don’t have the time to go hunting for the exact things that I want.